Check Out These Acts on the Torrance Refinery Stage on the Torino Plaza! Click here to get your FREE tickets to attend the 2018 South Bay Festival of the Arts! 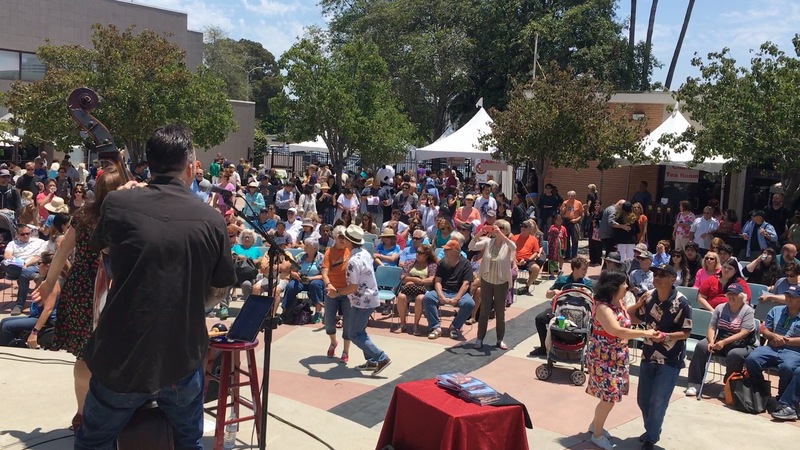 The South Bay Festival of the Arts will take place on Saturday, June 23rd from 11:00 am to 5:00 pm. Live musical acts and performing artists will perform on three stages throughout the Festival. Check out these popular acts who will be featured on The Torrance Refinery Stage on the Torino Plaza! Download the complete class and show schedule for the Festival by clicking here! Back for their third TOCA appearance is Aileen Quinn & the Leapin’ Lizards! With a frontwoman who made a name for herself as the Golden Globe nominated actress (for the 1982 film Annie), Aileen Quinn and the Leapin’ Lizards are a high-octane band who deliver foot-stompin’, groovin’ tunes to audiences everywhere. The powerful vocals stylings and masterful musicians of the Leapin’ Lizards take audiences on a ride through a mix of classic and Rockabilly hits from the 50s and 60s. What began as a chance meeting at the University of Denver has grown into a musical career that includes over 200 performances a year, and more than 15 CD releases. Andy Hill and Renee Safier bring a unique brand of music to every performance. Part fan family reunion, part rock ‘n’ roll tent revival, their music will move both your heart – and your feet (usually at the same time). Jason Ferg, a singer and songwriter from Chicago, makes music that’s a blend of soul, hip hop, and inspirational music. He was deeply inspired by the artists and writers who were a part of the mid-1990s Chicago poetry scene, and decided to dedicate himself to honing his talents and sharing his voice with the world. Jason creates music that is true to his personal values and convictions, and he is just as comfortable singing as he is rapping. His music will tug on your heartstrings and resonate deep within your soul! Award-winning Russian-American pop artist, singer, and songwriter, Marina V is like the “musical lovechild of The Beatles, Tori Amos, and Tchaikovsky.” Her songs have a timeless and haunting melodic quality that stick with you long after her performance is over. Rebel Rose is a live cover band who plays all the great classic and alternative rock hits that audiences love to dance to. With three strong female lead vocalists, Rebel Rose covers songs from Bon Jovi to Joan Jett, Aerosmith to Alanis Morissette. Do you support the arts? Want to gain visibility in your community? Then consider becoming a sponsor of the festival! Spotlight on your company in emails to our email list, on our website, and blasted out to our social media community. 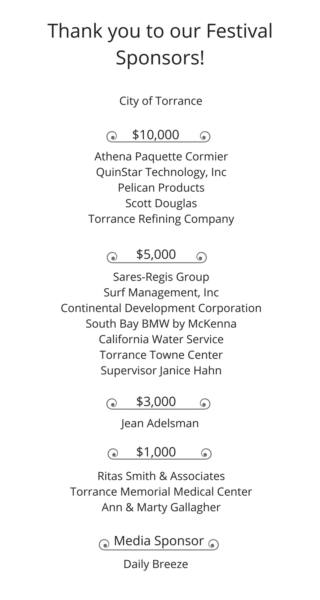 If you’re interested in becoming a sponsor, please call (310) 378-8100 or email info@torrancesarts.org.